Man has learnt predicting since it grew intelligent. Other living beings also seem to possess this instinct. Given the present scenario one can say what will happen after sometimes. Say, we throw a stone into air. We can make a guess where the stone will fall after some time because, we know how much force was applied while throwing the stone or with what velocity. Mathematics is an efficient tool in predicting events with pin point accuracy. Many physicists since a very long time have worked on developing mathematics for predicting events. The works of Gallileo, Newton, Lagrange, Euler, De Alembert known as Classical Mechanics helped set the foundation of the technologies of the era before 20th century. Works of Maxwell, Faraday, Kirchhoff, Henry, Ampere and many other prominent scientists of that time contributed to the development of the Classical Electromagnetism which described the behaviour of electricity and magnetism. Given the necessary parameters at a moment e.g. velocity, position, acceleration of a particle, using these equations one can predict the future of the event i.e. the velocity, position, acceleration with pinpoint accuracy. By the end of 19th century most of the major discoveries had already been taken place and the scientists were summing up their works. But to their astonishment the beginning of 20th century proved that it was just the beginning. Soon they witnessed a dynamic change in their understanding about nature. Some experiments were carried out which could not be explained using classical ideas. It was discovered that deep under the atomic world nature behaves in a completely different way and is governed by completely different set of laws which are counter intuitive to our daily experience. Those are the laws of Quantum Mechanics. These laws showed that we cannot predict events in the atomic level with certainty. We can talk only in terms of probability. Max Planck’s Quantum Theory in 1900 showed that energy is quantised i.e. energy is always transferred in discrete amount, not continuously. Neils Bohr incorporated this idea to his model of atom. Rutherford’s planetary model faced strong criticism and was rejected. According to Classical Electromagnetism any accelerating charged particle emits energy in the form of electromagnetic waves. In Rutherford’s atom electrons are moving in circular path i.e. they are constantly accelerating every moment. Thus the atom should loose energy in the form of electromagnetic waves and should spiral into the nucleus. Thus it should show a continuous spectrum of smeared colors .But it does not justify the stability of the atom and neither the results of his own experiment. Moreover, he could not explain why heated gases show only discrete strips of colors and not continuous spectrum. Bohr’s model (1913) showed that the electrons can move only in certain orbits of specific radius, not in any orbit. In those orbits they do not emit energy. The electrons jump from a lower orbit to higher orbit by gaining some energy (e.g. when heated) and jumps from a higher orbit to a lower orbit by losing energy in the form of electromagnetic wave i.e. light of a specific color. That is why gases when heated show strips of colors in their spectrum and not a continuous combination of colors. Here it is very strange idea that while jumping from one orbit to the other the electron is nowhere in-between. It is as if the electron did not move through space. Bohr was highly successful in describing the structure of Hydrogen atom or Hydrogen like atoms but failed to describe many electron atoms or large atoms. Moreover, it could not justify Heisenberg’s Uncertainty Principle. Werner Heisenberg made a very important observation in the year 1927. He observed that it is impossible to measure the position and momentum of an electron simultaneously to 100% accuracy. The more accurately you measure its position, the more uncertain is its momentum and vice versa. It is because we use light photon to observe the electron. For better resolution of the microscope the frequency of the light photon used should be high and we can measure the position of the electron to our desired accuracy. But, then we have to make a compromise with the momentum .The high frequency photon imparts a momentum to the electron and thus the uncertainty about the momentum increases. On the contrary if we choose to measure the momentum accurately, we have to reduce the frequency of the light and thus the uncertainty about position increases. Thus we are not able to find the present position and momentum of the electron. Hence, we cannot predict the position and momentum of the electron after sometimes. As a matter of fact one cannot assign a definite path for an electron. Moreover, Louis De Broglie showed that every matter has both wave and particle like property. However, with increase in mass or decrease in velocity the wavelike property becomes less pertinent. The experiment which gave a blow to the physicists was the Young’s double slit experiment where the light is replaced by a steam of electrons. When this stream of electrons is passed through two slits and allowed to hit a detector, they show an unusual pattern of alternative bright and dark fringes. But, electron is a particle; how could it show such pattern which only waves can form? So, the physicists of that time were convinced that classical physics has some limitations. A new framework for describing the atomic world was inevitable. This was the birth of Quantum Mechanics. In 1926 an Austrian physicist, Erwin Schrodinger developed a second order partial differential equation named in his honor as Schrodinger’s Equation. This equation is the foundation of Quantum Mechanics. The solution of this equation which is a wave function gives all the information about the particles in the system concerned. 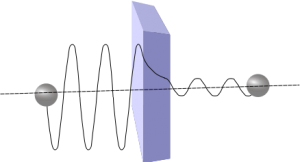 Whereas the wave function has no physical meaning, the square of its absolute value at any location at a certain moment gives the probability of finding the electron at that location . The strangeness about the equation is that the equation depicts particles as three dimensional waves. It is as if the particle is spread out through space which means that the electron is at many different locations at the same time. Until and unless we look for it, it is almost everywhere with varying probability. Even at infinity there is a finite probability of finding the electron. As soon as we look for it nature itself compels all the possibilities to collapse and the electron presents itself at a certain location with certainty. Some people believe that Quantum Mechanics is not applicable to the macroscopic world. But, though it has never been observed, the mathematics implies that it is equally applicable to the macroscopic level. That’s really a weird picture of reality. After these developments, further refinement of the existing mathematics for different types of systems was very obvious. Classical statistics did not hold good in describing the behaviour of the systems of subatomic particles like electrons, protons, photons etc. Einstein in collaboration with the Indian mathematician Satyendranath Bose came up with the Bose-Einstein Statistics (BES), one of the two Quantum Statistics. BES explained the behaviour of the particles like photons, gluons, Higg’s boson etc. Particles obeying BES are called Bosons (named in honor of Satyendranath Bose). It led to the discovery of the fifth state of matter, Bose-Einstein Condensate. Other of its kind was the Fermi-Dirac Statistics developed by Paul Dirac and Enrico Fermi. It described the behaviour of the particles like electrons, protons, quarks, composite particles comprising odd number of these particles like many atoms, nucleus etc. These particles are termed as Fermions named after Enrico Fermi. Paul Dirac pioneered the relativistic description of Quantum Mechanical version of Classical Electromagnetism, introduced the concept of Antiparticles and predicted the existence of positron, the antiparticle of electron which has been successfully confirmed. Richard Feynmann advanced Dirac’s work on electromagnetism and developed Quantum Electrodynamics (QED) and for the first time Quantum Mechanics was in full agreement with Special Relativity. For this work Feynmann was awarded the Nobel Prize in physics in 1965. One of the most bizarre phenomena of the quantum world predicted by the mathematics of Quantum Mechanics is the Quantum Entanglement. The mathematics shows that if two electrons are brought close to each other and separated by any distance, then the electrons get entangled as if some invisible link is connecting them together. If an action is made on any one of the two, the other gets affected within no time. For example, let us consider the spin of electron. Say, two electrons are brought close to each other and then separated by a very large distance (let us take one of the electron to the surface of moon). Now until and unless we measure, both the electrons are in a superposition of both up and down spin. But, if upon measuring we find the spin of the electron on earth to be up, then the spin of the other one on the moon surface immediately turns to be down even if there was no connecting link between them. This is something Einstein could not digest throughout his life. According to Einstein how could the effect reach the other one instantly as nothing can move faster than light. But, experiment after experiment Quantum Entanglement has been proved to be right. It has been used in theorising Teleportation of particles and even human beings. Teleportation of some particles, based on Quantum Entanglement has already been carried out successfully in various laboratories across the world. Einstein termed it as “Spooky action at a distance” and debated against it till his death. A cat, a flask of poison, a radioactive source, a hammer tied to a spring and a detector are placed inside a closed box. Now we switch on the radioactive source. 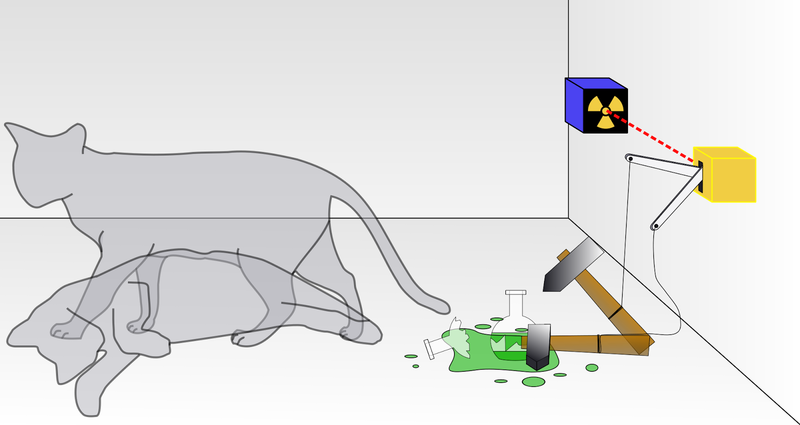 If the detector detects any radiation, the hammer is released and it shatters the flask of poison and the cat dies. But, until and unless we open the box we cannot say certainly whether the source radiated or not. That is both the cases have equal probability. It radiated and did not radiate at the same time. Thus, the cat is also both dead and alive at the same time. But as we open the box, immediately we find that the cat is either dead or alive. How is it possible? How the cat which was both dead and alive at the same time suddenly turned to be either dead or alive? This paradox has puzzled even the most brilliant minds of the world and no one has come up with a satisfactory answer till now. Consider the case of rolling a ball up a hill. If we do not provide enough velocity to the ball it fails to roll over the hill. A certain amount of minimum kinetic energy is a must for the ball to reach the other side of the hill. It is the classical picture of the story. 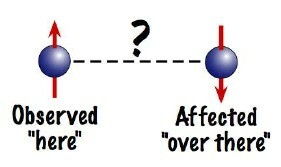 The very same case in the atomic level behaves in a counter intuitive way. 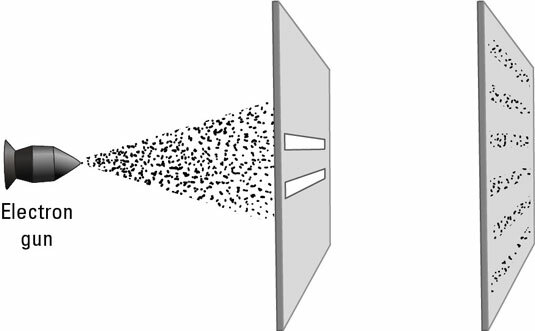 A particle moving against a potential wall can reach the other side of the wall even if it does not possess the minimum energy. It is because particles behave like waves in the atomic level. 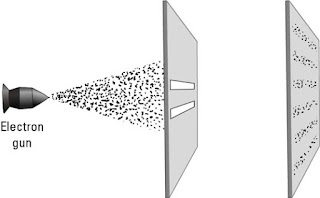 The particle wave extends to the other side of the wall and there is a finite probability of finding the particle on the other side of the wall too. It is as if the particle tunnelled through the wall to the other side. It’s really a bizarre fact and we cannot deny it. Because, this property was used in designing the electronic devices like Tunnel Diode, Tunnel Field-Effect Transistor and the Scanning Tunnelling Microscope. After the development of Quantum Mechanics the world of physics started to move in a direction that Einstein did not want to go. Though he contributed to the development of Bose-Einstein Statistics, the probabilistic interpretation of reality in Quantum Mechanics greatly dissatisfied him. Quantum Mechanics says that until and unless you look at the sun, it is everywhere in the universe with different probabilities. But as we look for the sun, all the probabilities collapse and we find the sun at a certain position. But, Einstein was very much discontented on this explanation. He said the sun is exactly at a certain position even if we do not look for it. One of the famous quote of the debate was : Einstein to Bohr, “God does not play dice”. Bohr replied on it, “Stop telling God what to do”. Einstein believed that, though the mathematics of Quantum Mechanics is highly successful in predicting the bizarre picture of nature, its interpretation is incomplete. Einstein sensed that something was missing in Quantum Mechanics. 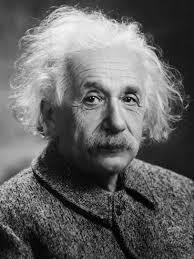 Einstein stood firm in his words and did not believe in Quantum Mechanics till his death. On April 18, 1955 Einstein breathed his last with his work left incomplete. Quantum Mechanics is the most elegant achievement of human kind. It has large contribution to the development of 21st century. Erwin Schrodinger and Paul Dirac were awarded the Nobel Prize in physics in 1933 for their contribution to the development of Quantum Mechanics. Erwin Schrodinger is called the father of Quantum Mechanics. But, even after almost nine decades of its development we have not succeeded in answering the basic question, “What does it mean about reality?”. Even the brilliant minds of the world put their hands up. We cannot suspect the consistency of these laws. Because, the whole world of electronics is governed by the laws of Quantum Mechanics. These laws were used to design the diodes, transistors, integrated circuits etc. If Quantum Mechanics goes for a strike for a while, then all our electronic instruments like cellphones, computers, televisions will go off. What is not clear is its interpretation. Falling into this trap Feynmann once made the famous quote, ”If you say that you understand Quantum Mechanics, you actually don’t understand Quantum Mechanics”. Whatever be the case we must be very thankful to those genius minds who introduced us to the strange world, the Quantum Realm. Most of the credit for the technological advancement of the present world goes to them. For over 300 years classical physics was the backbone of the modern civilization before 19th century. Newtonian Mechanics (Classical Mechanics) and Maxwell’s Electromagnetism(Classical Electrodynamics) were the driving forces of the modernization. Newton’s “Philosophae Naturalis Principia Mathematica” is a scientific marvel of all time. This book reflects Newton’s mathematical insight to explain the laws of nature. Maxwell’s four equations in electromagnetism unified magnetism and electricity into a common fundamental interaction called the Electromagnetism and endorsed the world with hi-tech electric machineries. a) The laws of physics are the same in all inertial frames (non-accelerating frame) of reference. It implies the absence of a universal frame of reference which was confirmed in Michelson-Morley Ether experiment in 1887. Suppose, you are juggling a ball in a train moving with a constant velocity (inertial frame). Your intuition may say that the ball has to be left behind you when you throw it up and you have to stretch back to catch the ball. But, from your experience you know that the ball always falls on your hand and you need not stretch back to catch it. This is sufficient to understand from this thought experiment that the laws of physics are the same in all inertial frames of reference. Again suppose, A is moving in a spacecraft with constant velocity in outer space towards B who is stationary (for our convenience of understanding) at some point of space. Now say, all the visible masses of the universe are removed. In such a situation none of them can prove by any experiment who is actually moving and who is stationary. Each of them will find the other one moving towards him. It implies that there is no absolute motion. Every motion is relative. In other words there is no universal frame of referene. Had any one of them been accelerating he would have felt a force which would have proved his state of motion. b) The speed of light is constant in all inertial frames of reference. This postulate resulted in the conclusion that nothing can move faster than light. In the late 19th century it was found that the relative speed of light is always constant i.e. approximately 3 x 10^8 m/s irrespective of the observer i.e. whether the observer is moving towards the direction of light or against it. This postulate was an incredible one and it totally changed human perception about space and time. He showed that space and time are not two distinct entities. Instead they are intertwined into each other as a flexible common fabric known as the “Space-time Continuoum”. 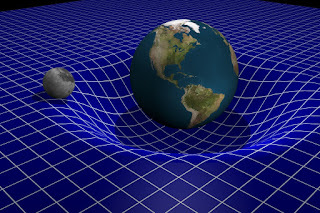 Einstein explained that it is the spaceward motion of the observer which reduces his timeward motion which slows down the course of time (time dilation). Space and time adjusts themselves to keep the speed of light constant. As the speed of an object increases space gets contracted and time gets slowed down so that the speed of light remains constant. The more it moves through space, the less it moves through time. This phenomenon is noticeable only when the speed of the observer is comparable to that of light. The mathematics of special relativity also implied that the length of an object gets reduced with increase in speed (length contraction) and mass of an objects increases with the increase in speed. All these phenomena has been experimentally proved and have been used in several modern technologies such as the Global Positioning System popularly known as GPS, particle physics etc. Another important implication of this theory was the mass-energy equivalence principle defined by the equation E=mc^2. This equation has been considered as the world’s most famous equation. It means that mass can be converted to energy and vice versa. This equation has been used for realising nuclear power. b) A person in a spacecraft moving with an acceleration ‘g’ in outer space. b) A person in free space where any source of gravity is not present. not escape and thus it looks black. 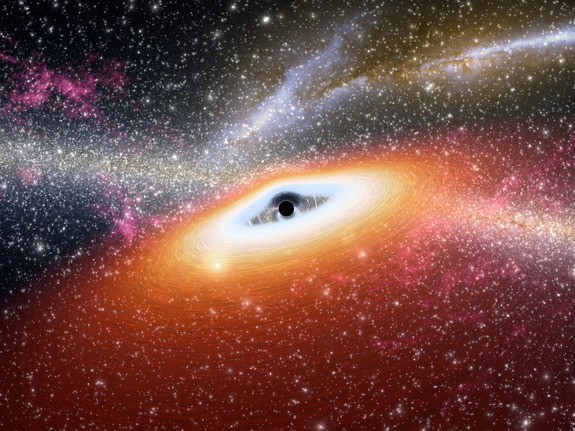 Scientists claim that a supermassive black hole exists at the core of our Milky Way galaxy. Gravitational lensing is the phenomenon where, as because light gets deviated from its straight path due to gravity of some stars, we get distorted or multiple images of the star. 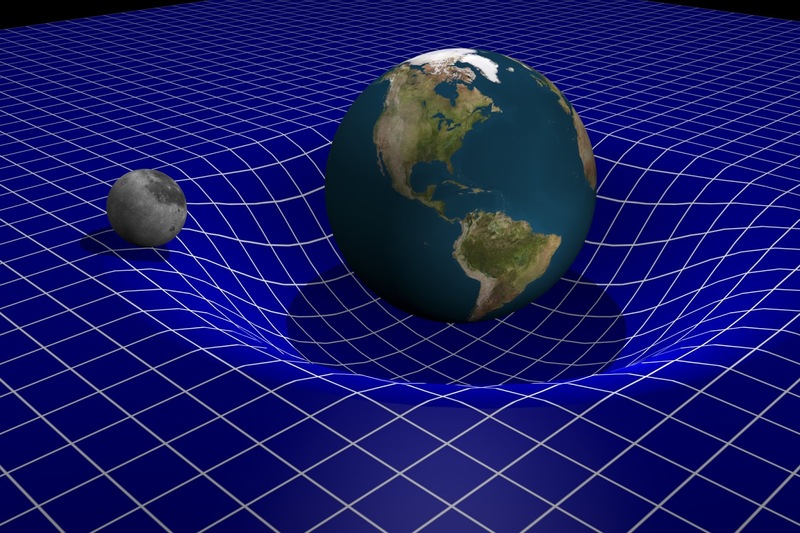 Gravitational waves are caused by some cosmological explosion like novae and supernovae. Scientists all around the world are in a hunt for gravitational waves which if detected will be the greatest success of General Relativity. Einstein’s ideas totally transformed the face of earth and human perception about reality. Most of the modern discoveries like the Neutron Stars,Black Holes,Nuclear energy,LASER,GPS and even Big Bang Theory can’t be explained without using Einstein’s ideas. He also contributed substantially to the development of Quantum Mechanics. He developed the Bose-Einstein Statistics in Quantum Mechanics in collaboration with the Indian Mathematician Satyendra Nath Bose. which helped in the discovery of the fifth state of matter called the Bose-Einstein Condensate. The particles which obey Bose-Einstein Statistics are called Bosons (e.g light photon), named in the honour of Satyendra Nath Bose. However, Einstein opposed the probabilistic interpretation of reality in Quantum Mechanics .Due to his mind blowing ideas he remains the greatest scientific hero of all time even after six decades of his death. He is worshiped by millions who love to rejoice the beauty in the laws of nature. A low profile patent clerk turned the greatest physicist of all times, he is really an inspirational figure in human history.